Louis is a Richmond local, who caught the speed bug quite a long time ago, and started off racing Karts in WKA & VDKA. Over the years, this racing bug developed into a full-blown passion for making cars perform better. While Louis worked during the day as a seasoned master technician for Ford, Toyota and Mazda (as the Rotary expert), he practiced his true passion after hours – building modified cars. Over the past 12 years, Louis has been involved in a number of performance builds, ranging from 1,000whp Supras, to NASA-prepared Mustangs, to street-focused Subarus & Hondas, along with many of his personal favorite, EVOs, including his own (EVO IX MR, 430whp, 5-speed swapped, cage, dialed suspension). His current lineup includes a 2013 Subaru WRX STI and a 1992 Nissan Skyline GTS-T Type-M. While Louis enjoyed his work during the day, he couldn’t help but wish he was able to do what he loves day in and day out. When he heard National Speed was opening a shop in his home town, he jumped at the opportunity to pursue exactly that. 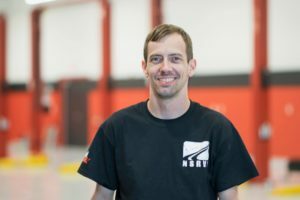 With his lifelong passion, impressive technical background, and broad skill set, Louis is an incredible addition to the National Speed team, and is excited to be serving his fellow local enthusiasts!